One of the most iconic vehicles in our collection is Standerwick 25, the Gay Hostess Atlantean double deck coach. These were Ribble’s response to the start of the motorway era in the UK and were specifically designed for the long distance services such as Lancashire to London. They were equipped with toilets and food and drink facilities complete with a hostess who served the refreshments. The initial 15 entered service with the Ribble fleet but the remaining 22 went into the subsidiary company W.C. Standerwick. 25 was one of the first batch of 10 delivered to Standerwick in 1960. Much more detail on the origins and operation of the Gay Hostess can be found on our related website at www.gayhostess.co.uk You can get to this site by clicking on the link from our links page. 25 was taken out of service in 1970 and was acquired by Youngs of Rampton in Nottinghamshire. 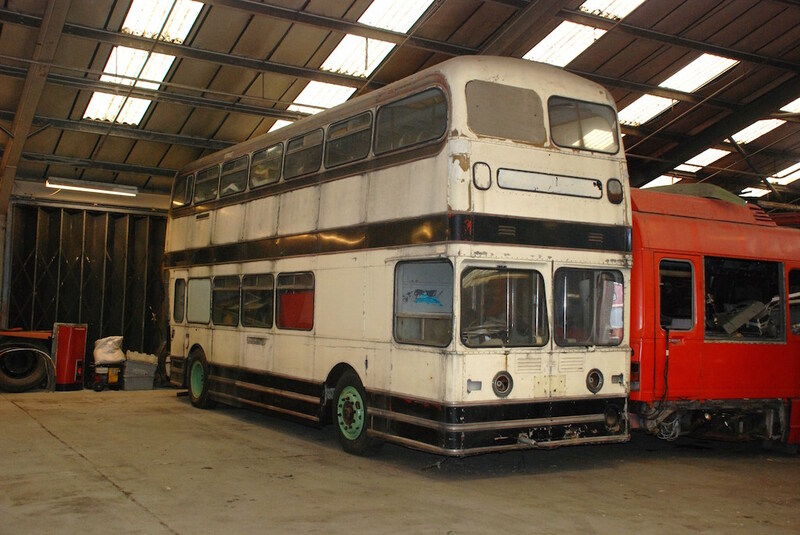 It was acquired by RVPG in 1976 and was driven back to Lancashire. At the same time the group acquired 33 from Eltham College in south London as a source of spares. Although 25 is a prime candidate for restoration it will be a costly and complex project and to date funds have not been available to allow it to proceed.